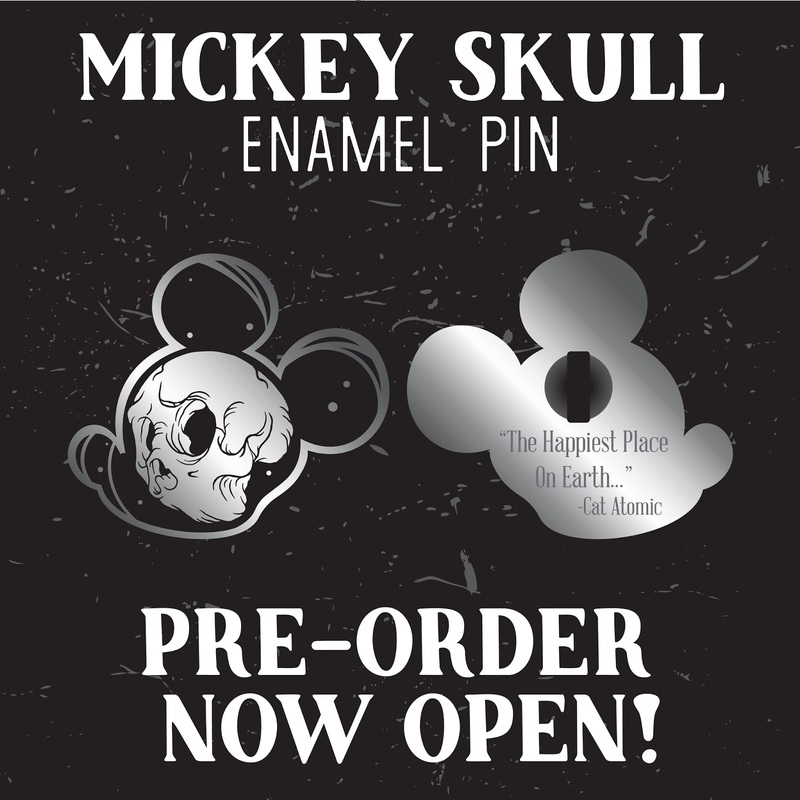 Pre-orders are open now for Cat Atomic's new Mickey Skull enamel pin. This is a 2-inch die struck enamel pin with a black fill and laser engraving on the back for $10. Get in on this now at their online shop. Please note: Pre-orders are estimated to ship around early to mid-March and are non-refundable. Just got back from Toy Fair setup day and got to the sneak peek of a really cool new project / label / subdivision of USAopoly: Project Raygun! And while I am literally frothing at the mouth trying to hold in who they've tapped to design one of their lines, I tell you this: she's an artist we've been fans of for 6 years now, super cool, and we couldn't be happier for her. 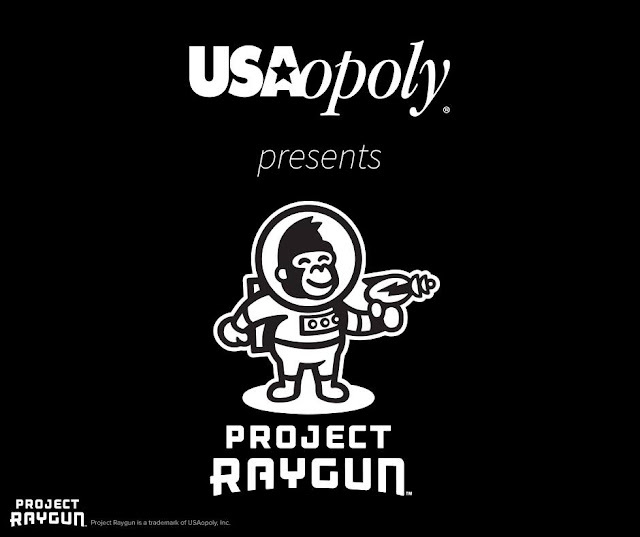 And her line is just part of the Project Raygun offerings. Ugh... can't tell any of you more right now but you'll all find out probably by end of this weekend. I'll post pics when I am allowed to. 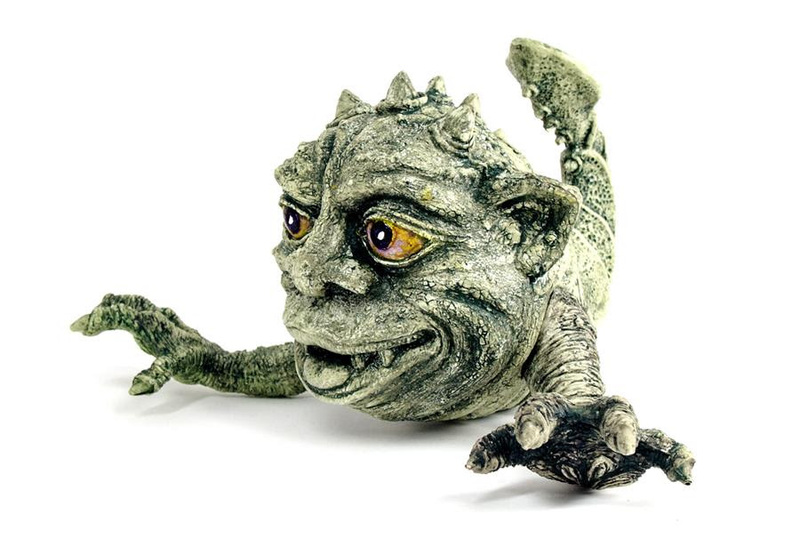 At 6.5" tall and 10" long, The Evolved Boglin is the first full sized figure in the relaunch of the Boglins line, officially licensed by Seven Towns. Pay With Amazon is changing their name to Amazon Pay, so I thought it might be a good opportunity to remind our customers that Amazon Pay is one of the 3 ways you can check out and pay at TenaciousToys.com! If you shop on Amazon a lot (like us!) you are already set up to pay via the Amazon system. You may be signed into the Amazon system right now! Checkout with Amazon Pay (or Paypal, or Credit Card) is super easy in our cart: just look at the bottom right corner and click the payment method you prefer. The "Check Out" button gets you to the credit card payment screen. 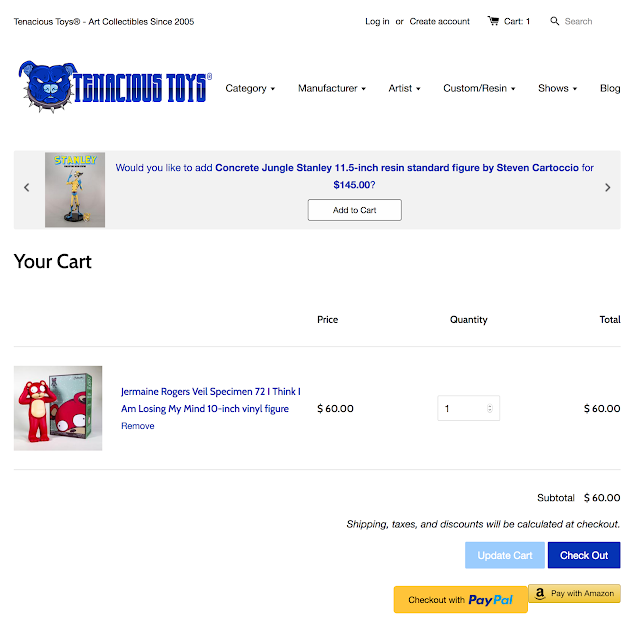 Why not going shopping now at TenaciousToys.com? We have such sights to show you! Our site is even fully secured (you'll see https and the green lock icon in your browser bar) so you can be sure that when you open the box, no Pinheads will get your personal info! Love is in the air! Valentine's Day is coming and so are a pair of new DHP releases. Keep your eyes on the webshop this Ferbruary 14th and be quick with that keyboard. Releases will go LIVE before I leave for work in the morning. Cast in electric pink vinyl this unpainted version of Apalala is the first official webshop drop. Show that special someone some love by giving the gift of monsterous affection or do some self love and grab one for yourself. Made in Japan. Not intended for children under 14 years old. $130 each. A great companion piece for the previously released unpainted pink Alavaka Bodhisattva and the previously mentioned unpainted pink Apalala. Do you have a partner with a sarcastic sense of humor? This is the perfect Vday gift if so. 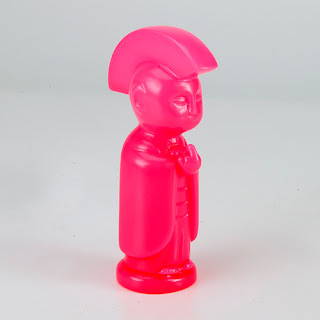 Cast in electric pink vinyl. Made in Japan. Not intended for children under 14 years old. $30 each. Ninjago has been one of the longer running original IPs for Lego, and has successfully managed to stay very popular and in demand. The much larger dragons and mechs in the set are seriously some of the most beautiful and complex designs I've seen, and I hope to review one of those larger ones in the near future. In the meantime, I was going through my piles of yet unopened, not yet reviewed/built sets and found a polybag that I had overlooked. This was was the "Skybound Plane" set, a simple smaller airship piloted by a single Pirate mini-fig. This build was a bit of a let down. The minifigure is actually quite detailed, and has some cool aspects in detail, but I felt they really phoned it in on the plane design. It follows the Ninjago aesthetic pretty well for the most part, but at best, it was a 10 minute build. And surprisingly, this was the very first set I have ever opened that had NO spare bricks of any kind left over after building. That was pretty odd, as Ninjago is really REALLY popular with the age group that loses the hell out of bricks, only to have your bare feet find them later in the most pain inducing sort of "kill me now, I just impaled my foot on a bright yellow Danish stalagmite" kind of way. Paints a hell of a picture huh? Yeah, call me Bob Ross. I know you won't. So in conclusion, although the sum of the 30 LEGO bricks to make this plane are actually pretty awesome for kitbashing and creating other cool things from, the actual build is alright. Not the most sturdy, and even for the adult collectors, it's nothing but a bit above average. I'll be back next week, with a different polybag build, to show how a cool mini vehicle can really work out with just 10 more bricks added to the count and produce a much sleeker looking build, with the LEGO Movie Super Secret Police Enforcer polybag set! 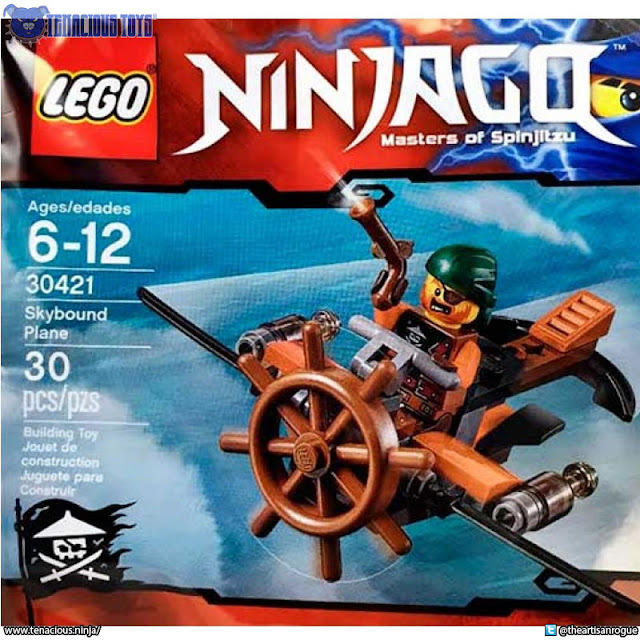 Trivia & Fun Facts The overall aesthetic of this subseries in the Ninjago universe has a distinct Clockwork/Steampunk meets traditional Pirates sort of feel to it. Give a sweet, gooey treat to the freak, fink or spazz in your life this Valentine's Day! The Freaks, Finks, Spazzes are back in a new marbled keshi micro edition just in time for the Lover's holiday. Spider Brains, Franken Corpse and Coffin Licker return in a rich brown and red marbled "Chocolate Covered Cherry" colorway. Each figure stands 3" tall, will be sold separately and will be priced at only $30 each. 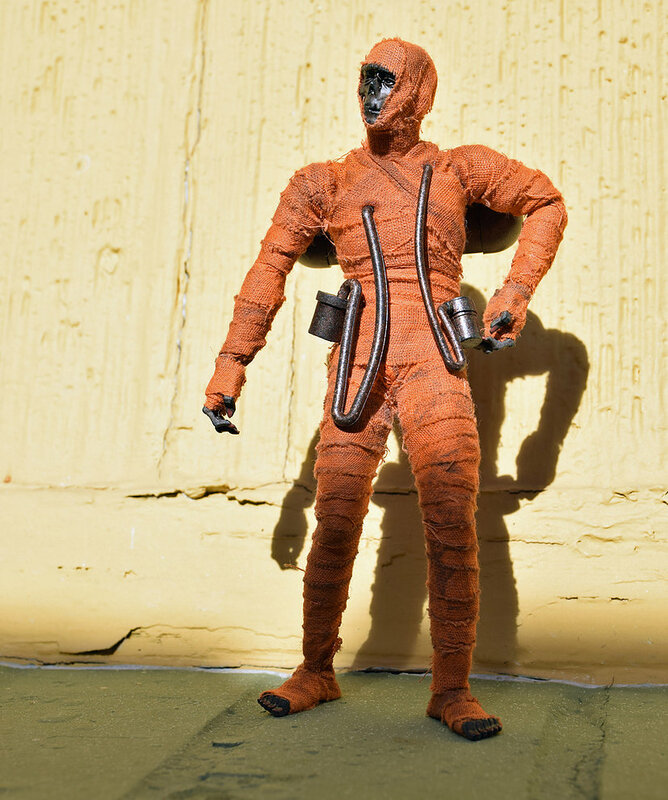 The FFS have been sculpted by Turtle Milk Studios and are cast in keshi rubber by Tru:Tek of Disart Toylabs. They are scheduled to go on sale this Valentine's Day at 8pm EST in the Radioactive Uppercut Web Shop so be sure not to miss out. Don't forget to follow Radioactive Uppercut on Instagram for the latest news and views on upcoming toy releases!